The fiber optics is the communication technology, it was initiated in 1976 in UK and USA. All the telephone copper wire has been replaced by the optical fiber. In copper wires the signal were traveling in the form of electric current while in optical fibers the information carries from one place to the other in the form of light i.e. electromagnetic waves. 1. Long distance signal transmission: low attenuation and super signal integrity. These are of three types of fiber optic cables commonly used, namely single mode, multi mode optical fiber. 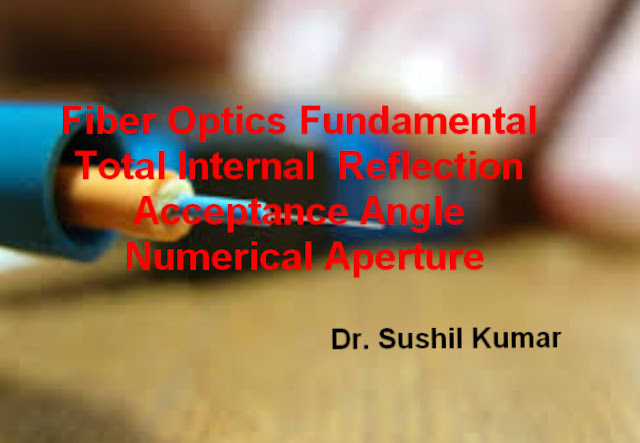 Total internal reflection is the man principle of the optical fiber communication, that depends on the concept of critical angle. In the above video TIR (Total Internal reflections) is possible only when the ray enter between the range of incident angle 0 to Acceptance Angle. Otherwise it is possible that it penetrate the classing region.